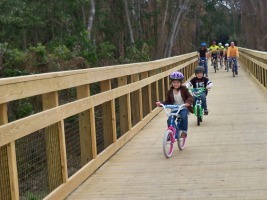 The City of Casselberry first developed a City-wide bicycle trail concept in May 1995. Since this time, the City has designed and constructed Zinnia Trail, established a priority listing of trail development in the City, and developed a Bicycle Master Plan. The Bicycle Master Plan is a city-wide trail network linking neighborhoods, parks, businesses, and schools throughout the City. (The Bicycle Master Plan has subsequently been integrated into the City's Multimodal Transportation Master Plan.) This trail network provides connections and opportunities for convenient, close-to-home recreation and active transportation. As part of this plan, the Casselberry Greenway Trail (formally known as the Wirz Trail) is a 5 mile corridor that connects users of the trail to 4 parks, 2 schools and various local shopping areas. Click here for a map of the Casselberry Greenway Trail. Section I – 2.5 mile connector to the Seminole County Kewanee Trail. The alignment of this trail will begin at the Kewannee Trail off Wilshire Boulevard, continue east over State Road 436 and Winter Park Drive, and travel through Wirz Park. Signage and pavement markings will be added along Mark David Boulevard adjacent to Wirz Park and along Wilshire Drive, Brittany Circle, and Laurel Way to serve as a connection between Trail Section I and Section II. The design and construction of this section was funded by the Florida Department of Transportation. Section II – Section II was completed in January 2010. It is a 1.5 mile trail that will connect to Section I in the vicinity of Laurel Way and Brittany Circle. It proceeds north and west through Crystal Bowl Park, continues south and west around Casselberry Elementary School and South Seminole Middle School, joins the Zinnia Trail and connect to the Casselberry Greenway Trailhead at the intersection of Marigold Road and S Winter Park Drive. The Trailhead includes parking, benches, trash receptors, and an information kiosk. Section III – Section III was completed in November 2014. It is a 1.0 mile trail that begins at the Casselberry Greenway Trailhead at the intersection of Marigold Road and S. Winter Park Drive, continues west around the Casselberry Golf Course and ends near the intersection of Southcot Drive and Triplet Lake Drive.